The world of Microsoft Volume Licensing is evolving. At one time, Enterprise Agreements (EA) were the go-to method for enterprise businesses to obtain licenses over 500 seats or more. However, this model, with its 3-year agreements, Licensing Locks, and un-wavering binding, have become obsolete. By putting your Microsoft assets in the cloud, such as Azure and Office 365, we can make managing your licenses easy, and affordable, with flexible Microsoft Volume Licensing options. With a Cloud Solutions Provider (CSP) plan, you pay a monthly fee only for the licenses and software your business uses. No more having to renegotiate your EA, and possibly paying penalties, if your business finds itself needing more seat licenses, or new software licenses part way through your contract. Or worse yet, throwing money out the window on licenses you will never use. 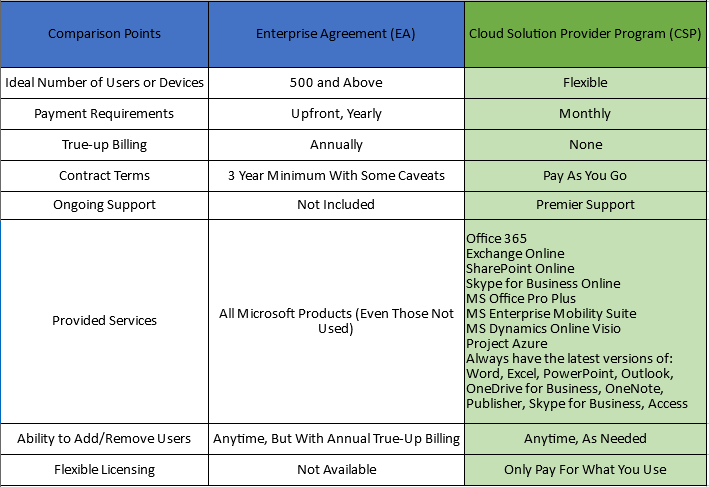 The chart below outlines the main differences between EA and a CSP models. Once you see the benefits of the CSP model over the antiquated EA model, let Hoplite Solutions assist you in finding the best CSP package for your business needs. Copyright ©2019 Hoplite Solutions, All Rights Reserved.